The first term for this academic year is now at an end and we can finally get on with our Christmas celebrations and enjoy a well-earned rest from school. In terms attendance for the Autumn Term, despite some nasty viruses affecting many of us, our whole school attendance figure is 96.3%. Well done to Year 7 who gain a Year Group Achievement Point for being the best attending year group at this stage. Kilby are leading the way for both the overall percentage and the number of students who have been in school every day this term. Congratulations to the 398 students across all houses who have a 100% record for attendance so far. Best attendance in Da Vinci is D08, for Kilby the winning tutor group are K09, Marie Curie have M01 leading the way and finally, for Somerville, S08 are the best attenders. 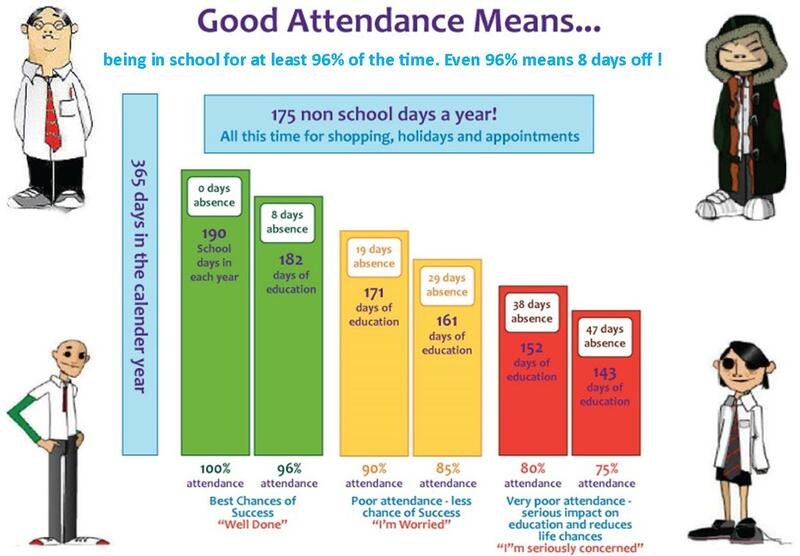 As you can see it’s really close with the overall House Attendance Competition, although we are a little too close to that magic number of 96% attendance as the minimum expectation for the best success at school, so let’s aim for great attendance for the first week back and then on through the rest of the Spring Term 2019. The first half term for this academic year is now at an end and we look forward to a week away from school and then the beginning of a number of celebrations both in school and with family and friends. At this point we look at how the tutor groups are getting on with the Attendance Competition. For September, D08, K04, M04 and S01 were the winners. As you can see it’s really close with both the tutor group and overall House Attendance Competition, so let’s aim for great attendance for the first week back after half term to give all Houses a chance to come out on top. As we return to school, we look at the attendance figures for the first month of the academic year at Calthorpe Park School. The attendance statistics for September show that Year 7 have the best attendance with 98.3%, closely followed by Year 11 97%. Our Whole school September attendance stands at 96.9%. When looking at the percentage attendance data per house, Da Vinci and Kilby lead the way for September attendance. We are a little too close to the magic 96% this early on in the year, so there is room for improvement; let’s see you all in school every day! As we come to the end of another academic year, it is time to summarise and celebrate attendance at Calthorpe Park School. The attendance statistics for the full academic year show that Year 8 and Year 10 are to be commended for remaining at and above the magic 96% (to be fair, Year 7 are only 0.2% below this!). This is great news, as we have achieved the target set last September! When looking at the percentage attendance data per house, Da Vinci led the way for July attendance with Kilby close behind and Marie Curie and Somerville sharing 3rd place. We wish you a very happy summer holiday and look forward to welcoming students back on September 5th. Please make sure you keep an eye on the school website for the specific timings for your ‘new’ year group. February has now come to an end and we started March with an unexpected 2 days of heavy snow. Hopefully spring is now underway and we will see warm and sunny weather in the run up to Easter. The attendance statistics for February show that Year 8 are to be commended for remaining at and above the magic 96% (to be fair, 10 are only 0.3% below this!). Unfortunately for the first time, the whole school monthly attendance figure of 95.3% falls below our target 96%, so we need a push on great attendance from all our students as we head towards the summer term. As we look at the attendance data for January, we have a whole school attendance figure of 95.7%. This is still a little lower than the 96% target Calthorpe Park School is aiming for, but taking into account the various winter infections going round, we are not too far behind where we need to be. When looking at the numbers of students who have been in school every day of January, congratulations to the 882 of you, who have yet to miss a day of 2018. Winners of the Year Group Achievement Point for last month are Year 8. In fourth place was Somerville, with its 90 students with 100% attendance, giving their House a rating of 96.1% overall. Kilby had 86 100%-ers giving the House attendance rating of 96.3% overall, so Kilby is in third place in this “attendance leader board”. In second place, Marie Curie had 80 students recorded with 100% attendance, giving Marie Curie 96.4% overall. A good overall percentage but a lower number of 100%-ers compared to other Houses. So, in first place, it was Da Vinci where there were 104 students with 100% attendance, and a House statistic of 96.5% overall. All students with full attendance have their names displayed as a roll of honour on the Attendance Matters noticeboard along the main corridor through the Science Department in School. November has now come to an end and we can start getting excited about all the events which take place both in school and the local community in the run up to Christmas. The attendance statistics for November show that Year 11 and Year 7 are to be commended for remaining at and above the magic 96% (to be fair, Year 8 and 10 are only 0.1% below this!). Despite the cold weather and associated infections that we see at this time of year, the whole school attendance figure of 96% gives the majority of our students the best chances of success in the future. As we look at the attendance data for the first half term, we have a whole school attendance figure of 96.5%. While this is pleasingly above the 96% target Calthorpe Park School is aiming for, we have yet to move into the cold weather and the illnesses that it brings with it. There is a balance between not spreading your germs and finding school more challenging because you have missed important learning opportunities. As we look at the attendance data for September, overall we have 97% attendance. Year 8 are leading the way with 97.8% overall attendance & Marie Curie are just in the lead with 97.5%. Can I remind all students and parents that the start of the school day is 8:40 am and our expectation is that all students are lined up ready for tutor time to begin at this time. Following this week’s Senior Staff Late Sweep, a small number of students are not even on the school site by this time! The gates around the site are locked just before 8:40 am, so students who walk along the back of school need to be planning the start to their day to ensure they make it onto the site before the gates shut. Anyone travelling to school by car needs to take account of traffic and would be advised to aim for an 8:30 am arrival, which gives a small amount of spare time without resulting in a late arrival. Persistently late students are sanctioned to encourage them to develop good habits regarding their punctuality in the future, as well as ensuring a prompt and productive start to the day for all members of our school community. The figure for whole school attendance up to and including September 26th stands at 97.4%. Year 8 are leading the way with 98.1% and Marie Curie are the best House at this stage with 98%. Can I remind all students and parents that the start of the school day is 8:40 am and our expectation is that all students are lined up ready for tutor time to begin at this time. Following a recent Senior Staff Late Sweep, a small number of students are not even on the school site by this time!